‚Filming Peace and War in Cinema‘ is a common initiative I have undertaken together with independent Turkish Media platform p24 and the Open Society Institute, in order to defend independent media and free thinking. 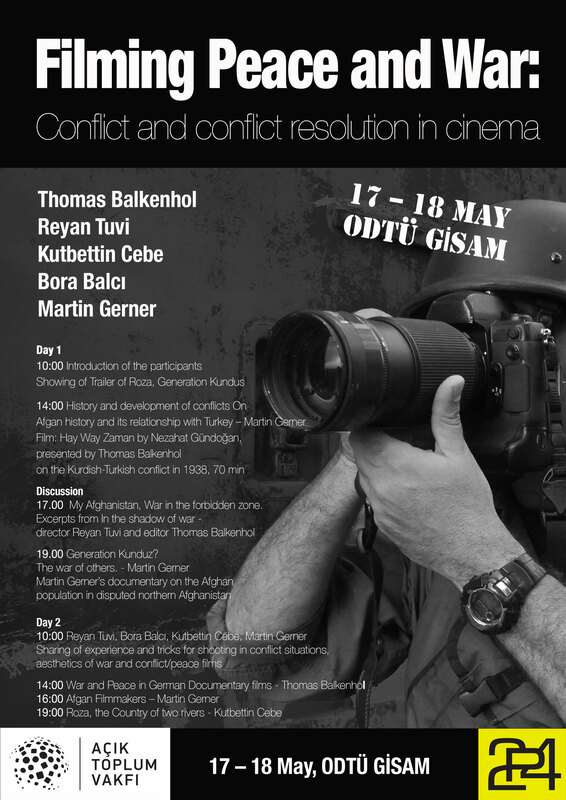 The workshop wants to hightlight, compare and analyse examples of documentary films and filmmaking from Germany and Turkey about the Afghan war, the Syrian war and about the Turkish-Kurdish conflict. Comparative reflexions on understanding the emergence of armed conflicts, their driving forces and ways to reach to conflict resolution will be debated with film excerpts and in exchange. Among the few groups who regular witness conflict and methods of conflict resolution are documentary filmmakers, local and international ones. In the current Syrian war, Turkey and Germany are involved in the war against ISIS/Daesh at different levels. The other coin of the medal is the ongoing refugee crisis, in which Germany has bound its political fate to Turkish promises of support in keeping Syrian and other refugees away from Europe. Even before the Syrian war, Turkey and Germany have both been engaged in the war in Afghanistan, each with its own military contingents as part of ISAF and, away from the battlefield, in an aid effort to contribute to conflict resolution and development, good governance and a peaceful environment. All aims have failed in Afghanistan, while Syria looks like it will reproduce some of the patterns that have caracterized the Afghan war. The Syrian war also carries conflict elements that are bound to the vicinity of the Kurdish populations in Syria itself, in Iraq but also in Turkey itself. What patterns of conflict and of conflict resolution are visible here in comparison? How are local populations approached and how do they cope with armed conflicts?